Preparing for the big move to Office 2010? Here are four tools you should download to help you assess your environment and plan your migration. 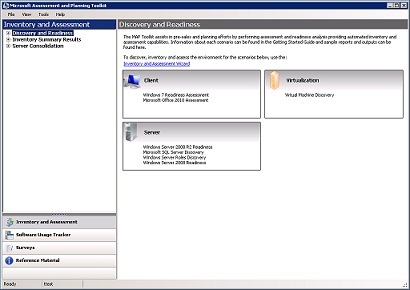 The Microsoft Assessment and Planning Toolkit (MAP) is designed to help IT Professionals prepare for a deployment. The tool will inventory your environment and assess whether the systems throughout your environment are ready for the migration. MAP, which is an agentless tool, can help you prepare to deploy a number of technologies including Office 2010. 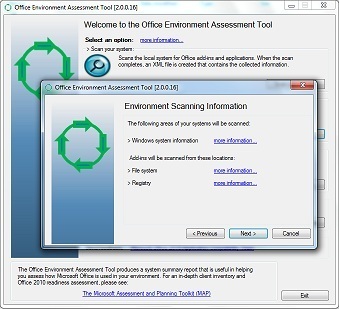 The Office Environment Assessment Tool (OEAT) scans client computers for add-ins and applications that interact with Office 97 through Office 2007 Office system. It is designed to help IT Pros avoid any post-deployment surprises, by assessing application compatibility with Office 2010. In other words, OEAT checks to see if any systems throughout the environment use add-ins or software that may break when Office 2010 is deployed. 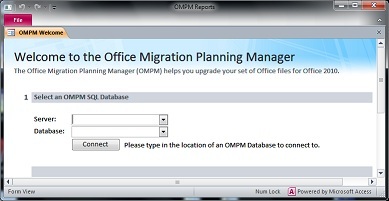 The Office Migration Planning Manager (OMPM) can help IT Pros who need to assess the compatibility of older Office documents (.doc, .xls, and so on) to the newer—better—OpenXML formats (.docx, .xlsx, etc.). This can prevent unforeseen issues with existing documents your organization relies on. Additionally, OMPM 2010 will assess macro compatibility and 64-bit Office compatibility. This toolkit also contains the Office File Converter, which enables bulk document conversions from the older binary Office formats to the OpenXML formats. Designed with developers in mind, the Office Code Compatibility Inspector (OCCI) is nonetheless a handy assessment tool for your Office 2010 migration. OCCI is an add-in that helps developers troubleshoot and resolve potential issues with Microsoft Visual Basic for Application (VBA) Macros and add-ins. It scans code in a project for known compatibility issues, and then notifies you if it finds items in the code from the object model that have changed in some way or have been removed, automatically commenting code to clearly guide the developer to specific lines of code for remediation.